Yesterday I was about to set off for the memorial service for Thanpuying Poonsuk, but I was overcome with sadness, so much so that I couldn't get in the car. Instead, I ended up having a late lunch with writer-producer David Giler (I'm sure everyone in the world has heard of Alien) who's back in Thailand after a round of Hollywood. When I got home from lunch and several cups of high-octaine coffee, I was energized, perhaps overly so; anyway I drowned my depression by producing several pages of my novel The Stone Buddha's Tears, which is only about a couple of years late getting delivered to the publisher. 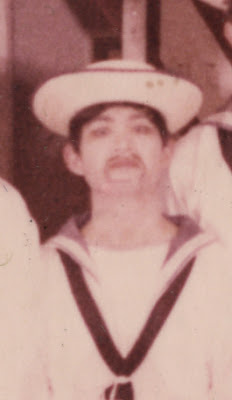 For your amusement, here's a photograph of me in the sterling role of Bob Beckett, the Carpenter, in HMS Pinafore in approximately 1969.